Carthage is remembered these days as the main enemy of the ever-expanding Romans in the third and second centuries BC. The two burgeoning empires fought the three Punic Wars, the second of which was when Hannibal launched his unsuccessful campaign of invading Rome by leading elephants over the Alps. He did manage to win some battles and kept on fighting for years, but he lost most of his elephants and was ultimately defeated. 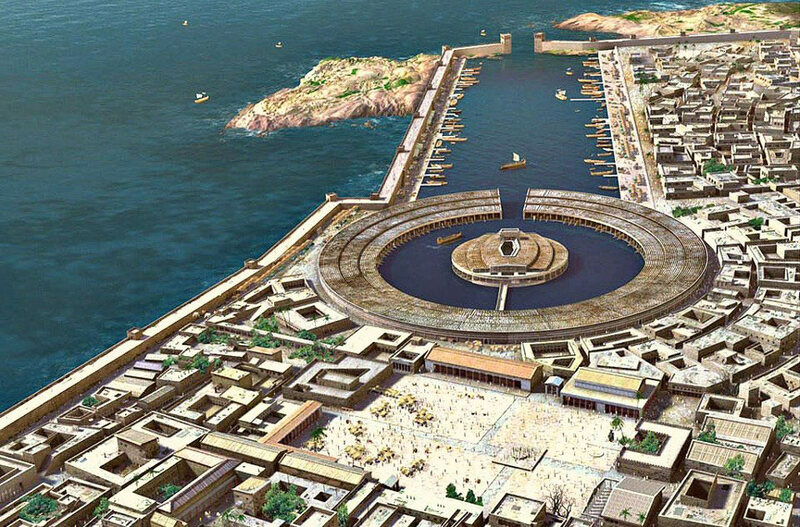 Finally, the Romans besieged the city of Carthage, sold its inhabitants into slavery, entirely destroyed it, and allegedly salted the earth so nothing could grow again. This last element, while memorable, doesn’t seem to have appeared in any historical sources prior to the nineteenth century. Besides, if the Romans were taking the land for themselves, why would they have reduced its economic value? And salt was expensive in those days anyway. The former Carthaginian holdings became part of the Roman province of Africa Proconsularis. The city of Carthage, which was located on the northern coast of what is now Tunisia, and at its height controlled parts of Sicily and the Iberian Peninsula. Most accounts say it predates Rome itself by some years. It began as a Phoenician colony, eventually becoming independent around 650 BC. It remained a culture with a good deal of Semitic influence, including its worship of Phoenician gods, albeit with some differences. Their main deity was Ba’al Hammon, who was associated with weather and fertility, and apparently sometimes the recipient of human sacrifices. “Ba’al,” a term used frequently in the Bible to refer to just about any foreign (i.e., non-Yahweh) god, is a Semitic term meaning “Lord.” The name “Hannibal” is often interpreted to mean “grace of Ba’al.” The legendary founder of Carthage was a woman named Dido, sometimes called Elissa, a princess in Tyre. She was married to her uncle Acerbas or Sychaeus, a priest of the god Melqart. Her father intended her and her brother Pygmalion (not the same guy who fell in love with the statue) to be joint rulers after his death, but Pygmalion took all the power for himself, and had Acerbas killed in order to obtain his money. Dido fled from Tyre with her supporters, eventually coming to Africa. Iarbas, the Berber king of the area, regarded by mythology as a son of Ba’al Hammon and a nymph, agreed to give Dido as much land as she could enclose within an ox’s hide. By cutting up the hide and wrapping it around a hill, she gained control of much more land than Iarbas had intended. The king, impressed by this, decided he wanted to marry her, but she had herself immolated instead. The most famous account of Dido is in Virgil’s Aeneid, in which Aeneas and his companions visit the newly-founded Carthage after fleeing Troy, and she falls in love with him due to the machinations of Juno and Venus. Iarbas, angry that she would reject him but marry somebody else, prays to his father, whom the Romans associated with Jupiter. 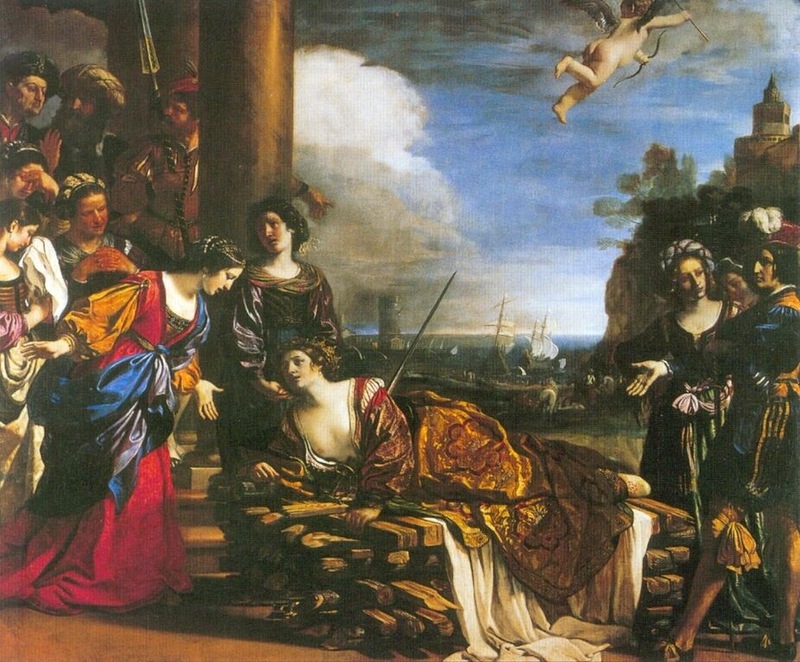 Mercury visits Aeneas to tell him to move on and fulfill his destiny in Italy, and when he does so Dido declares that his descendants would be in constant enmity with her people before burning herself to death. The poet was, essentially, shipping two characters from mythology, and Dido ended up going down with the ship. Virgil also gives her a sister named Anna, whom Ovid associated with a Roman goddess representing the year. Why Anna wasn’t figured into their father’s succession plans isn’t clear. This connected the descent of the Romans from Trojans with the beginnings of Carthage, and it ended up being anachronistic. Menander of Ephesus, at least if the citations of his work by Flavius Josephus are correct, claimed that Dido and Pygmalion were the sons of a ninth century BC king named Mattan, who was also the nephew of the Biblical Jezebel. The Trojan War, on the other hand, occurred sometime around the twelfth century BC. But then, Virgil doesn’t appear to have been as concerned with historical accuracy as with a grand mythical explanation for the founding of Rome and its relationship with Carthage. This entry was posted in Greek Mythology, History, Middle East, Mythology, Roman, Roman Empire, Semitic and tagged acerbas, aeneas, aeneid, africa proconsularis, anna perenna, baal, baal hammon, carthage, dido, flavius josephus, hannibal, iarbas, jezebel, juno, jupiter, mattan of tyre, melqart, menander of ephesus, mercury, ovid, phoenicia, punic wars, pygmalion, rome, trojan war, troy, tunisia, tyre, venus, virgil. Bookmark the permalink.